Taylor-Made Deep Creek Vacations & Sales is a Deep Creek Lake family vacation rental and real estate company that has joined forces with The Sonder Project, a global nonprofit organization focused on ending extreme poverty and hunger worldwide. Taylor-Made will be participating in the nonprofit’s PROJECT: feed program developed for the travel industry. 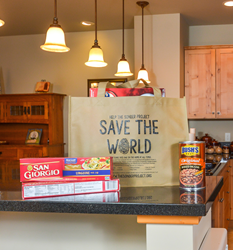 As a Collection Partner for PROJECT: feed, they will distribute a reusable grocery bag, provided by The Sonder Project to their rental properties. They will then invite their guests to leave any unopened, nonperishable items in the bag at the end of their stay. After the guest has departed, the full bags will then be picked up for distribution to the Garrett County Dove Center (a local charity). Future plans include expanding the donations to other area food charities. This program not only allows the company to give back to those in need, but also helps to reduce waste. o Every Thanksgiving, food is donated to provide complete holiday meals to families in need. o In 2015, items were donated to bring Christmas cheer to residents of a local nursing home. o Starting in January 2016, bedding items are being collected for the Garrett County Animal Shelter. Additionally, Taylor-Made owners are very involved with local organizations. Jodi Taylor-Refosco was a board member for the Dove Center, an organization that provides safety, advocacy, and counseling to individuals whose lives have been affected by domestic violence. Jay Ferguson, Co-Owner of the real estate company, has worked with the Garrett County Board of REALTORS on their annual campaign to collect winter clothing items for area children. Also a Co-Owner of the real estate company, Betsy Spiker Holcomb participates in programs like the Hospital's Life Savers club and volunteers with HART for Animals. Taylor-Made Deep Creek Vacations & Sales was founded in 2008 and has grown to become a leader in Deep Creek Lake vacation rentals, real estate, and property services. Taylor-Made rental homes and sales listings are conveniently located within a few hour’s drive from Pittsburgh, Baltimore, and Washington, DC.